The many accessories ordered have started to show up at our door via FedEx. Those who didn’t order their fill of accessories back when they pre-ordered their iPad are having good luck with Best Buy stores. They seem to have been missed by the masses looking for hardware add-ons, unlike the Apple stores in the area. 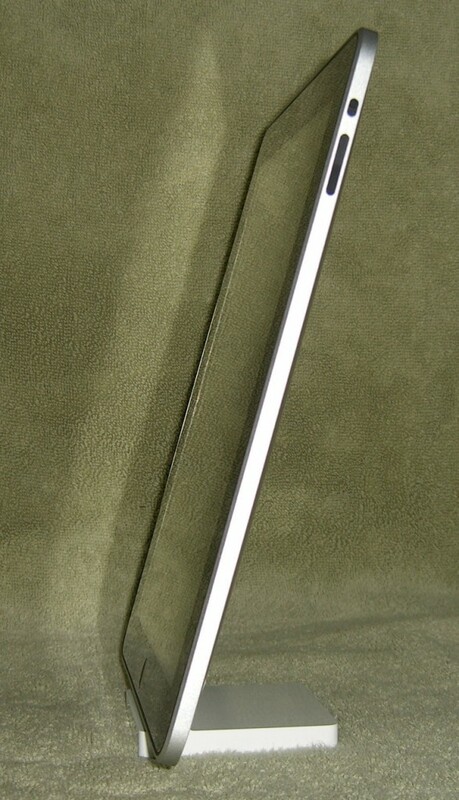 We mentioned the Apple thin book like jacket earlier, very popular around the office. For the Docks, they are now popping up here and there. Mostly just the Dock, but we hear folks that ordered the Dock/Keyboard combos are starting to see them now. 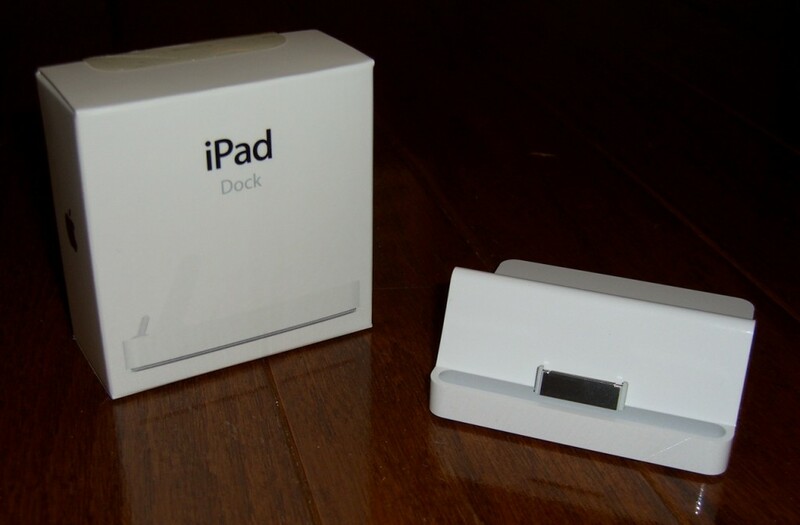 The Dock holds the iPad in a portrait, or tall, position since it uses the sync cable connector on the iPad as the anchor. At home, our first dock found a home in the kitchen as we said we would. We never realized how much we wipe our hands off in the kitchen till we had a glass surfaced touch device we wanted to, well… touch. The Pogo Stylus has found a home in a cup next to the iPad dock. The dock holds the iPad at much less of an angle than more stands we are used to seeing. While at the office, sitting on a desk or table, this is fine. At home in the kitchen, the angle means less reflective ceiling light glare but it also means you can’t walk up and look down on it. This could be good for keeping dust from landing on the screen… that is IF we had any dust in our house. Having images running in a slide show or recipes viewable from a distance both worked nicely. 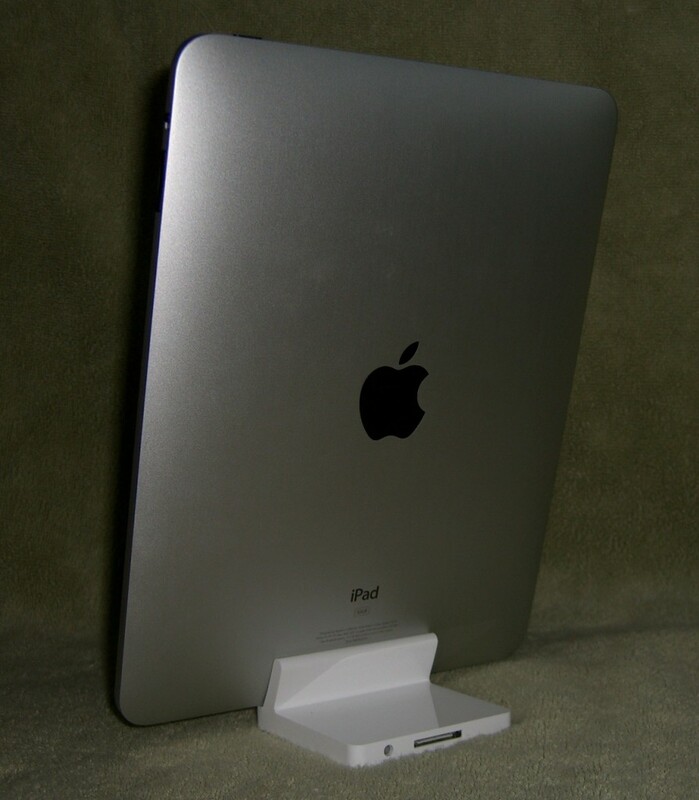 The iPad Dock has the connector opening in the back similar to the one on the device, so you can plug in your power cable that came with the iPad to keep it charged when docked. No cables come with the dock. For music or audio alerts, there is a audio out plug in the back. If you choose to play any audio from the iPad when in the dock, you can listed via the normal built in speaker. The controls for the audio, including volume appear on the screen. When you plug external speakers in, the on screen volume control goes away and you have to adjust via the actual speakers. Depending on your office layout, this can be good or bad since you now have controls in two locations, allowing for the volume to get turned down via the speaker yet the audio continues to play. Particularly noticeable if your playing an audio book. Later you may ask why you never didn’t know the second of three steps to becoming rich when it was played at no volume! Construction is at the normal Apple standard. With the iPad being larger than a iPhone you would expect a much larger back to the dock but due to the angle it isn’t needed. We did notice right off that you can not put the iPad with the Apple jacket on into the Dock, they have some pretty close fit standards on both. We wonder if Apple could have put a removable spacer on the back so you could dock with/without the jacket – perhaps it’s a weight issue then. A iPad in the dock with a cover would look less clean if the cover was having to be open to the side… not acceptable for the simple beauty that makes up Apple products.